As 2015 begins, we are excited for our 9th season of the PKB Girls’ Golf Tour. During January, I am providing a tour primer, outlining what’s new on the tour, answer some frequently asked questions and alert you to some items to be sure not to miss. This week, I will focus on the rankings systems, their importance to your junior golfer, and how increased national exposure is being generated by the PKBGT. As I discussed two weeks ago, many families struggle with tournament selection and choosing the right tournament for your level. Many feel the need to chase a ranking or status that they see another player may have. My feeling is the rankings have value for many players, but not as much as you would think and almost zero to the majority of players, especially those not playing a national schedule. If you have any questions or comments, please do not hesitate to contact me at 336-347-8537 or mparker @ pkbgt.org. >> Rankings, Do they Matter? For the established and aspiring national level player, the national rankings systems establish a benchmark for the recruiting process. Coaches review the rankings to identify players and gain an initial knowledge of the player’s ability. This is especially true for players from outside their traditional recruiting area. We experience often with players from the Midwest who are looking to come to school in the South. A coach will compare this player against a local recruit to establish an initial comparison. The key word here is “initial” as the rankings systems do carry an inherent bias to players in warmer climates as the majority of ranked events play in these areas, increased practice time availability, etc… Do not fret if your ranking may be higher, this is only the starting point for coaches. They will make their decision on recruitment off what they see in person and the scores you shoot, not by who is ranked the highest. Though, do not be surprised if they request you play additional tournaments where other players they are recruiting are playing. The ranking systems are trying to judge fairly and evenly, but creating these apples to apples comparisons in person are the best method of evaluation. For players still in the development process, a ranking is only a number on paper and should have no bearing on the decisions you make. Stay focused on lowering your scores, not your ranking. The Junior Golf Scoreboard currently ranks 2687 junior girls. For reference, players ranked in the 2,000’s currently have signed to play college golf next year. Being that so few players above 100-200 in the national rankings ever play head to head, the rankings become very subjective to the methodology used per system and thus get more and more inaccurate the higher up the rankings you go. For that reason, the PKBGT utilizes a ranking system called the Performance Index which is heavily weighted towards scoring differential, your score versus the course rating, which is more accurate throughout the ranking. On the PKBGT, our partnerships with the Golfweek/Titleist Ratings, AJGA Performance Based Entry, Junior Golf Scoreboard, the Joe Cheves Invitational and the state ranking systems of North & South Carolina we are increasing the opportunities for our members. These rankings allow PKBGT members to be recognized on a national stage by collegiate coaches as well as provide a forum to attract more exposure and recognition to the PKBGT and our players. Below I will highlight the different ranking systems and how they relate to your junior and the PKBGT. The Performance Index, http://pkb.shotstat.com/TournamentScoring/PerformanceIndex.aspx, is the official ranking system of the PKBGT. All players who participate on the tour earn a ranking on the Index, with official status on the Index being earned when a player completes 5 tournament rounds on the PKBGT. Players who have yet to complete 5 rounds are given a provisional index rank that shows where they will rank once they complete the minimum rounds requirement. The Index ranks each player based on scores, finish in events and tournaments won. Players scoring is ranked based on scoring differential, the players score each round subtracted by the course rating for that course. Scoring differential is a more accurate judge of player scoring than scoring average as it factors in the difficulty of the course and setup. The Index also factors in a weighted points earned which examines how many players a player beats in each event and the series they are participating in. Players also receive a bonus for event victories and the level of the event. Golfweek explains their system as “Jeff Sagarin’s rating system is based on a mathematical formula that uses a player’s won-lost-tied record against other players when they play on the same course on the same day, and the stroke differential between those players, then links all players to one another based on common opponents. The ratings give an indication of who is playing well over the past 52 weeks.” The rating is calculated using a player’s record, stroke differential and connection to all the other players in the database. In addition, the rating looks at schedule strength, schedule rank and the overall player win/loss record and requires 5 Golfweek approved events be played in before a player is given a rating. The Golfweek ratings are very selective as it ranks only 289 events yearly and are the elite ranking system for junior players. Learn more at http://www.golfweekrankings.com/ellington/default.asp?t=girls. Players who play a national schedule are very accurately ranked as all national events are included. Though, with this limited pool of events to judge players and its reliance on head to head competition to rank players, players who do not play a national schedule are not always accurately ranked. The ratings illustrate the strength of national events like the US Girls’ Championships and Joe Cheves Invitational and the AJGA Invitationals. For 2015, Golfweek/Titleist Ratings will continue to rank PKBGT Championships and the Tar Heel Classic at UNC Chapel Hill. Ratings will be submitted for all Bell & Prep Series players who complete the maximum amount of holes played per ranking regulations. As noted above, PKBGT events continue rank highest among junior tours, earning event strengths well above other regional tours in the East and rivaling some of the biggest tournaments in the country for our PKBGT Championships. As stated by the AJGA, the “Performance Based Entry was introduced in 2003 as the means to determine AJGA tournament fields. This enables 12- to 18-year-old members to earn their way into AJGA tournaments based on performances at the national, regional and state levels”. Performance Stars are required for players to gain entry into any AJGA events. By playing events at the regional and local level, players earn these Stars to gain entry. Again for 2015, the PKBGT maintains elevated status in the AJGA PBE. Players in all PKBGT divisions are eligible for AJGA PBE Performance Stars with qualifying performances. In the Bell & Prep Series, all PKBGT Championship winners receive 8 Performance Stars. The 2nd and 3rd place finishers will receive 4 Stars. For Classic events, all Bell & Prep champions will receive 4 Stars. For events with at least 18 in the Bell or Prep field, those who finish in the Top 10% of field are guaranteed 1 Star. For the Futures Series, all Championship & Classic event champions will receive 1 Performance Star. With an average of 50 players in Classic events in 2014, PKBGT is poised to provide the most opportunities on the East Coast this spring for players to earn AJGA status. The PKBGT will automatically submit tournament results to AJGA for players to receive recognition. Learn more at http://www.ajga.org/TournInfo/PBE/TOC.asp. All multi-day events will be ranked by JGE in 2015 for the Bell, Prep and Futures Series. 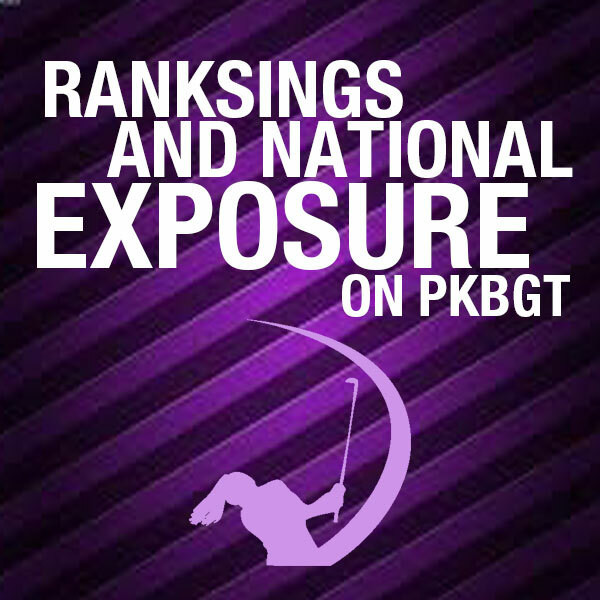 PKBGT will automatically submit results to JGE with each division being ranked separately. All players will earn a national and state ranking through JGE which offers a searchable database for all players on their website. Learn more at http://www.juniorgolfscoreboard.com/rankings_display.asp?gender=G. DID YOU KNOW: Three PKBGT members are currently ranked in the Top-20 in the Junior Golf Scoreboard national rankings, 2010 Colonial Open champion Lauren Stephenson (2015, Lexington, SC), 2013 Carolina’s Classic champion Bailey Tardy (2015, Norcross, GA) and 2013 PKBGT Open Championship champion Jillian Hollis (2015, Rocky River, OH). Additionally, players may seek entry into national Invitation only events or in the case of the states of North & South Carolina, gain points in the statewide ranking systems. On the PKBGT, all champions in PKBGT Championship events in the Bell & Prep Series earn an exemption into the 2015 Joe Cheves Invitational. In addition, the runner-up in the PKBGT Open Championships will earn an exemption to one of most prestigious Invitational’s in junior golf. For our North & South Carolina members, performance in the Bell & Prep Series will earn ranking points with the State Ranking Systems. For NC, increased multiplier status exists for the PKBGT Invitational & Open Championships in addition to the additional PKBGT Championships. All Bell/Prep players who compete at a PKBGT event will earn ranking points. For the South Carolina rankings, a 4x multiplier status is awarded for all PKBGT Championship events and the NC University Classic in the Bell & Prep Series. All PKBGT Classics events in GA, SC or NC will also count towards SCJGA rankings provided the player finishes in the top 50% of players per SCJGA guidelines. In the end, many different systems exist to rank junior golfers. Players should seek out events that challenge them and maintain the focus on the key goal, shooting low scores. Once you have maintained consistent success at a level, supplement your schedule with stronger events to test your game. Follow this formula and you will find your ranking will take care of itself.